The legend of the city of Atlantis has spellbound many throughout the ages. A combination of fact and interpretation sheds light upon this ancient mystery. An advanced race from an ancient city within a utopian island. Such are the legends that have covered the Earth of the fabled lost city of Atlantis. How much is true? if any? Like all historical legends, whether fact or fiction, they derived from somewhere, at a beginning. The only hard evidence of Atlantis known in existence comes from Plato. This Greek philosopher and mathematician lived in the fourth and fifth centuries before Christ, and the legend of this ancient lost city stems from his two dialogues, Timaeus and the Critias. Within the Timaeus, a character named Critias tells a tale passed down through his family that began with Egyptian priests. The tale is of a city named Atlantis, which lay beyond the pillars of Hercules (the straight of Gibralta). The city was on an island settled by ten sons of the god of Poseidon, and was alleged to be a peaceful and prosperous place ruled over by the divine dynasty. Atlantis consisted of five ringed islands, with the royal palace (and temple of Poseidon) located in the centre. Over time, this Atlantis paradise changed into an ambitious, war torn and greedy city. The Atlanteans attempted to conquer Europe and Asia, but were defeated by the ancient race of Athenians. What followed were huge earthquakes and great floods that swept the earth, sinking Atlantis in one day. This account of Plato’s supposedly took place around 11,500 years ago. Many scholars believe Plato’s account was simply allegory for struggles within his own day, as it was thought to be a safer way to criticise his society rather than the truth, following what happened to Socrates. The themes of Paradise lost and the great flood are parallelled in many myths across the world. Like Adam and Eve’s fall from grace, greed overtook paradise. Atlantis is therefore viewed as the first home, which is longed for return after the fall. This story of Atlantis has been tackled by various scholars, several of which have successfully managed to influence its telling through to modern times. Arguably the most influential of these was Ignatius Donnelly, who, while exaggerating Atlantis into new heights, garnered popular support for his ideas. He believed Plato’s account of Atlantis to be plausible, as it didn’t contain fantastical accounts of the supernatural, seen in Greek myths. Another notable Atlantis influence, who respected and then built upon Donnelly’s works, was 19th century esoterisist H.P Blavatsky. Blavatsky believed Plato’s account to contain hidden truths, which were a clever combination of truth and fiction. In her ‘Secret Doctrine’, she discusses vast races of humanity that lived on various continents. Lemuria is a term she ascribed to the continent of the third race, while the fourth were Atlanteans, just preceding our own. Blavatsky claims her knowledge was based on the Book of Dzyan, an ancient Tibetan doctrine passed to her through the Brotherhood of Mahatmad (masters), who purportedly governed the world from their headquarters in Tibet. W.Scott Elliot was another influential writer on Atlantis, who used clairvoyance to interpret his ideas. Scott worked with Charles Webster Leadbeater, an exceptionally noted clairvoyant who was thought to see remarkable details, which lead him to become (and remain) an authority on reading inner worlds. Several lesser known scholars attribute characteristics to Atlanteans. Lewis Spencer claims a sudden spike in art produced by the European Aurignacian man points to a highly developed influence that likely sprang from Atlantis. Indeed, he describes Atlanteans as exceptional artists, who’s skill was significantly more developed than the Egyptians. Rudolf Steiner, with substantially less historical aid, describes the people of Atlantis as having an outstanding memory. He adds that logical understanding was not a trait of the Atlantean, therefore they viewed the world differently than modern humans. Steiner describes the homes of Atlanteans as garden like, appearing as trees intricately woven in artistic fashion. 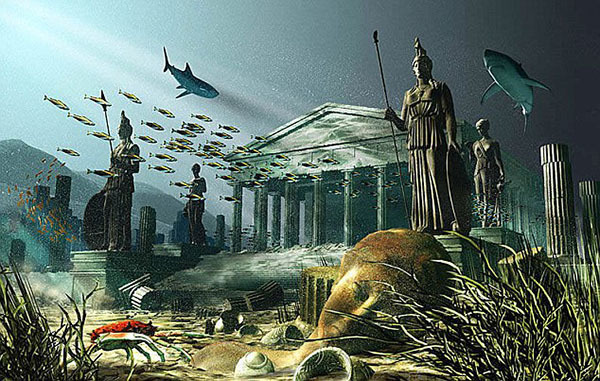 Whether fact or fiction, the fabled Atlantis city remains notably absent from school subjects. Atlantean history, however, lies waiting for the curious, the adventurous, or for the true believer of this lost world that was once thought to be. Childress, David Hatcher. 1988. Lost Cities of Ancient Lemuria and the Pacific. Adventures Unlimited Press: Illinois. Donnelly, Ignatius. 2006. Atlantis: The Antediluvian World. Book Tree: San Diego. Scott Elliot. W. 1925. Legends of Atlantis and Lost Lemuria. Quest Books: London. Spence, Lewis. 2007. The History of Atlantis. Cosimo Publications: London. Steiner, Rudolf. 2003. Atlantis and Lemuria. Kessinger Publishing: London.